Vegan activists have hosted a demo outside Dairy UK's head office in a bid to bring attention to what they call the 'dark side of dairy'. The event in London, on October 5, was the first in a planned series of eight street action events from Glasgow to London as part of animal welfare charity Viva! 's TRASH campaign. 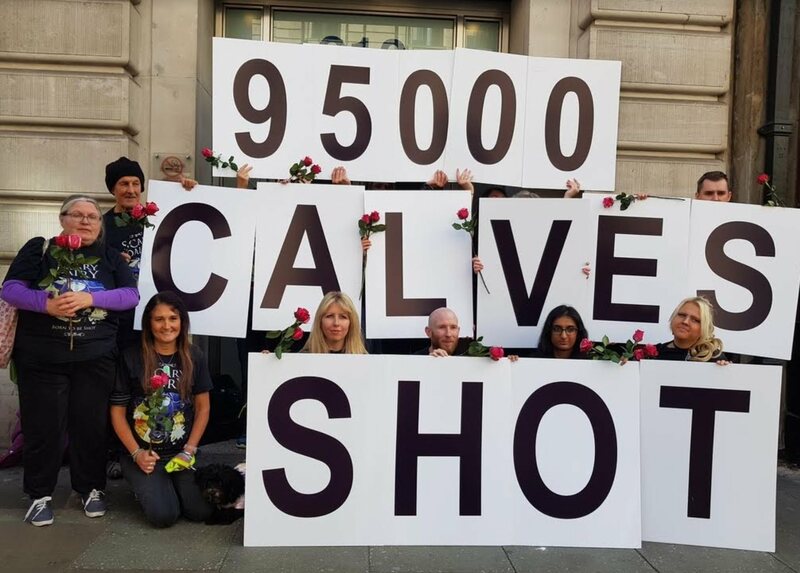 TRASH aims to raise awareness of the forgotten victims of the dairy industry – male calves, 95,000 of whom are killed within 24 hours of birth in a year - and forms just one part of Viva! 's ongoing campaign to highlight the dark side of dairy. The street action events aim to promote positive discussions about veganism and feature an eight-foot-tall inflatable milk carton covered with facts about dairy. Viva! was joined by local activist group Croydon Vegan Outreach. "Many people never see the darker side of the dairy industry," Laura Hellwig, Viva! Campaigner said in a statement sent to Plant Based News. "Dairy cows carry their babies for nine months – just like humans – but then have their calves taken away from them just hours after birth. "Male calves are considered a useless by-product and so are brutally shot in the head. It is so important that we share this information with the public and give them the opportunity to learn the truth behind the dairy industry. "There has never been a better time to try dairy-free products. By touring some of the largest cities in the UK, we hope to reach people who may have never considered veganism before."